The Quiltzette is going out a day early this week for a good reason. I was at this shop this afternoon pulling bolts for our clearance sale and was SHOCKED by how much we have available for our year-end clearance event. I don't want anyone to miss the first day of this sale. Above is a photo I took on the way out the door this evening. Don't worry about the poor, sad, mostly empty shelves behind the clearance tables. As soon as I hit "send" on this newsletter I'll be shopping like crazy to restock! Here's the scoop on the sale . . . If you live out of town . . . Durango, Pagosa, Farmington, Bluff, Blanding, Montiecllo, Moab, Kayenta, Aztec, Rico, Telluride, or anywhere even close to Cortez, believe me, this sale is worth a road trip. Text a couple of friends right now and make plans to visit us. Clearance fabric includes quilting cotton, batik, baby/kids cotton and flannel, and lots more. There will also be lots of kits, patterns, and notions on the sale table. I'll get to those in the morning before the doors open. Don't miss this sale! We've had our creativity hats on planning for the new year. Here's a sampling of what you can expect at Cortez Quilt Company during early 2016. (Who knows what later in the year might hold!). NEW! Since we're phasing out Class Club we decided to replace it with "Take Three, One Free." As the name implies, take three classes and your fourth one is free. Read the details at the top of the class page on our website. NEW! For anyone who admires sampler quilts but hasn't made on in a while (or has never made one) now is your opportunity. On the fourth Friday of each month we'll gather to work on a sampler quilt. Get the details on our class page. NEW! We have a new series called In The Kitchen which will be held on the third Wednesday of each month. In these classes you'll be making all things cooking and eating related . . . aprons, table runners, placemats, and much more. In January we'll make a handy insulated casserole carrier. NEW! 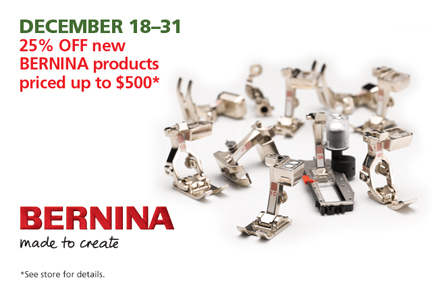 Feet Retreat is for anyone who owns a BERNINA sewing machine and wants to learn how to use more of the amazing presser feet that BERNINA is known for. The first Feet Retreat is scheduled for Sunday, February 7th. More details coming soon. IT'S BACK! We're reviving Block Lotto for 2016. Watch for more information in the next issue of The Quiltzette. Evening classes will continue to be held once a month. We're now calling these Evening Make-and-Take with the idea is that you will leave class with a finished project. Third Thursday Demos will also continue. We're going back to hosting these only at 12:30 p.m. on Thursdays since we've had small turnouts for the late afternoon sessions. However . . . each Third Thursday Demo will now be repeated on the Saturday following the Third Thursday so that those of you who work during week can still join in. This will begin in February. Early 2016 Youth Classes will be held on the following dates. Keep an eye on the Quiltzette for details. That's it for now. But rest assured there will be many more fun and exciting events coming your way from Cortez Quilt Company during 2016. 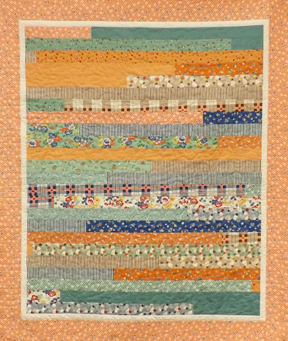 Make a lap-size strip quilt using a small “jelly roll” package. Add optional borders to make it a bit larger. Aimee King will teach this class. Please send lunch or lunch money with student. 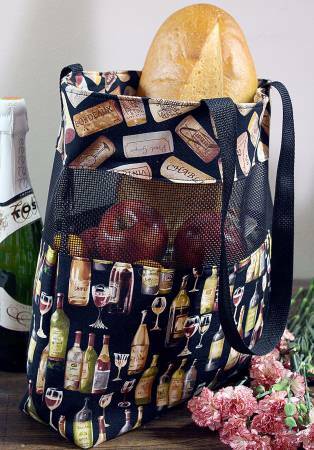 Guest instructor Lou Ann Burkett will teach our January Evening Make-N-Take class which is a handy vinyl market bag. You can fit lots of groceries in this large tote. Make several! Make this cute little zippered duffle in an afternoon with Judy Bryan as your guide. The pattern offers several different sizes and you’ll have the option to line the bag with iron-on vinyl if you’d like. These are great for storing cosmetics, power cords, sewing supplies, or just about anything else. Three more days . 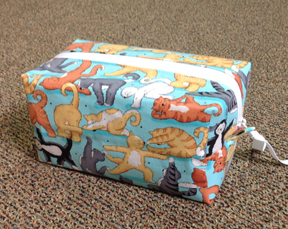 . .
Join us at either 1 p.m. or 6 p.m. to watch a BERNINA presentation on how to make this beautiful pillow. 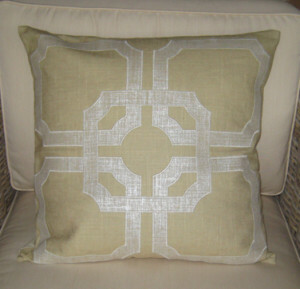 Tone on tone geometric appliqués are currently trending in home décor. Learn how to perfect your appliqué skills using built-in machine functions. Professionally finish your pillow with an invisible zipper and learn how to achieve perfectly turned corners. Also learn about satin stitch applique and get tips on perfect pivoting and corners. If you’d like to bring you machine and make (or at least get started) on this project, plan to stay for about 2 1/2 hours. Be sure to bring a Show & Tell for extra chances to win a doorprize! To RSVP for this free event please call us at 970-565-7541 or send an email to Cindy. the holidays and will return in 2016.